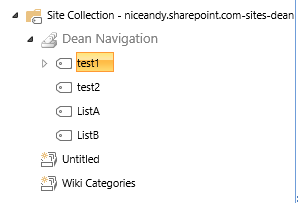 Using SharePoint Online as part of an enterprise Office 365 setup. I'm trying to get my site to force the full URL string in the address bar when clicking the site name in the header. I need the full string to list because I have all my subsites using forms and links with relative urls. If I click on the site title (where it says PAD Licensing) it will take me to the home page, but the URL in the address bar is friendly instead of the full URL. As a result, all my relative URL references don't work anymore. Find the term which points to the home page, change the Navigation Node Type from “Term-Driven Page with Friendly URL” to “Simple Link or Header”, provide the home page URL here. The below code works - I inserted it in by using the "embed code" function at the bottom of each page. It's not perfect, but it is an effective workaround. Not the answer you're looking for? Browse other questions tagged sharepoint-online url hyperlink header or ask your own question. How to get the site and web url from a full url?